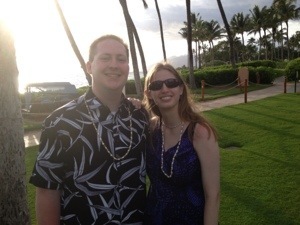 We went to Maui for a week and it was amazing. Afterwards I had a little bit of a Hawaiian hangover, like “why am I not moving to Hawaii?” (I believe this is a very understandable reaction to staying in a tropical paradise for a week after a long cold winter-spring!) I had been to Oahu and the Big Island before and I have to say, Maui and Hawaii are about tied for “favorite island” status. I mean, Hawaii has a (usually) active volcano, but Maui is just spectacular in so many ways. It’s like a mixture of Hawaii and my parents’ descriptions of tropical garden-island Kauai. No wonder it’s honeymoon central! So here are my top 5 things to do, plus a bonus. They are similar to every guidebook’s top 5, but with a twist. 1. Hang out on a beach! Maui has splendid beaches all over the place. There are beautiful, sunny, dry beaches on the “south” shore. They’re great for sunbathing (or “under-umbrellla-basking”), paddleboarding and snorkeling in the morning, and boogie-boarding in the windier afternoons. 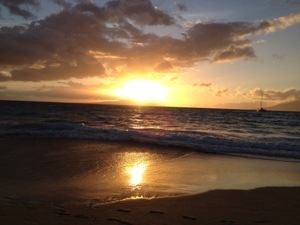 In Makena State Park, you’ll find Big Beach, an enormous classic sliver of sand with no resorts. Adjoining is Little Beach, a skinny dipping haven. Across the volcano near Hana, there are red sand and black sand beaches. Whether you want to lie on a blanket or take a walk with the sand squishing between your toes, or just take lots of pictures of beach sunsets, nothing is more relaxing than a good beach. 2. Get under the water! Our family took a snorkeling tour to the steep-walled islet of Molikini, spying some dolphins racing under the boat on the way, and also to a “turtle city” where we saw a few of the slow moving sea turtles. Chris and my dad also got scuba certified. Yes, it might be a little cold, but it’s so cool to see the amazing world under the waves… if only for a few hours. 3. Go to a luau! At least once in your lifetime, anyway. Held in a variety of venues, all of them are fun, spendy celebrations of one interpretation of Hawaiian culture (that’s a whole anthropological post in itself). We attended the one at the Grand Wailea and enjoyed a meal that satisfied my desire to taste poi, the Hawaiian staple made from taro (it tastes like tangy, runny, purple mashed potatoes). There were many dishes more attractive to the non-Hawaiian palate. The hula and fire dancers put on a fascinating show and we received beautiful shell leis and looked at souvenirs made by native craftsmen. 4. 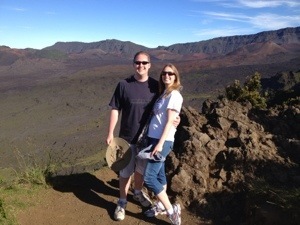 Check out Haleakala, Maui’s local volcano. Apparently it’s really awe-inspiring at sunrise, but guess what… it’s also really awe-inspiring in the afternoon! And not nearly as frigid! You drive up from sea level into this barren volcanic wasteland (similar to Mars) with a sparse population of the beautiful native silversword plants. It’s a nice change from the beach. If you’re really into riding downhill fast on a bike, you can do that on your own or with an outfitter. I enjoyed the car ride down just fine. 5. Go to Hana and explore the nearby coves and waterfalls. Everyone raves about the Road to Hana and it is great… if you like sinuous, convoluted narrow roads that frequently disappear to one lane (particularly over bridges) and have thousands of blind curves where you play chicken with fearless locals. No, really, the waterfalls and ocean views are stunning. Hana is a quiet town but “still waters run deep.” I’d love to spend more time there. We flew back from Hana and got some amazing views of the craggy coastline and the silver sparkle of inland waterfalls. 6. Read The Parrot Talks in Chocolate by Everett Peacock. A tiki bar, mai tais, a surfing bartender and a beautiful Tahitian dancer… it’ll put you right in the Maui mood. I really enjoyed Maui. The only downside was coming back. Of course, now that I’m back I can actually get unpacked. Well, aloha to all of you, and I can’t wait to hear about your summer adventures! This entry was posted in Miscellaneous, Travel and tagged Hana, Hawaii, Maui, paradise, Volcano. Bookmark the permalink.